What's better than a simple, yet special weekend dinner? This flavorful steak and dipping sauce require only eight easy ingredients and 20 minutes of your time. 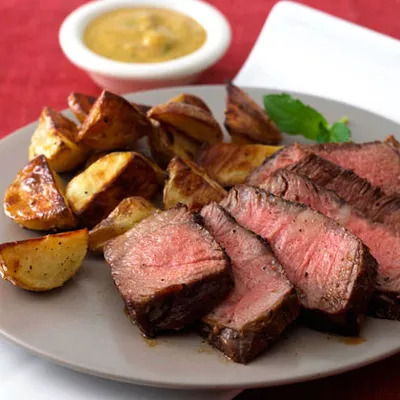 Plus, our New York Strip Steak recipe has just 320 calories per 6-ounce serving of steak with 2 tablespoons of the homemade mustard, honey, horseradish, and mint sauce. This recipe recommends using the stove to cook your steak, but you can also grill. Ingredients: Dijon mustard, honey, horseradish, mint leaves, Kosher salt, freshly ground black pepper, New York strip steaks, canola oil.